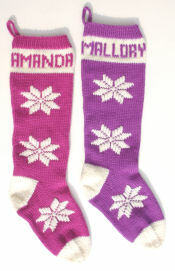 Here are examples of custom Christmas stockings that I've knit with snowflake pictures on them. Snowflakes are very versatile with regard to shape and size -- they can be tiny accents, or large central motifs. Although white is the most obvious color, pale gray or blue could also be used in some designs. Please look to see what Customers Say about stockings I've knit with snowflake pictures. A light scattering of snowflakes was added to the reverse side of a stocking. Although it's hard to see in the photo, the white yarn used for the snowflakes is wrapped with a silver thread, which adds a little sparkle. Here, the classic Nordic snowflake starts to look a lot like a poinsettia with the use of red and green. The white background creates a very crisp, clean look. The illusion could be enhanced with a cluster of gold beads in the center. Classic Nordic snowflakes against non-traditional colors make for a truly unique pair of stockings. There are many ways this design could be varied. Tiny flecks of snow could be added to the background, little sequins or beads could be added to the snowflake centers, or different background colors could be used. 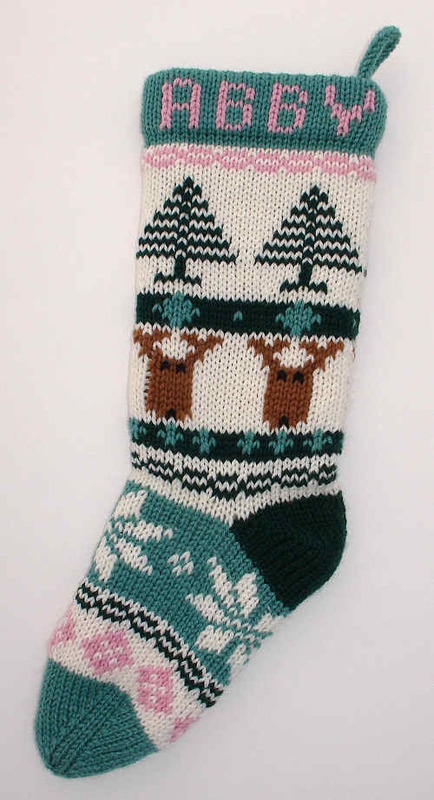 A row of simple snowflakes makes a nice border design on a stocking with multiple pictures. I included this stocking here for the snowflakes. I think one could make a beautiful stocking with scattered snowflakes on a deep blue background. The pictures in this stocking are interspersed with geometric patterns. These colors were chosen as a more feminine version of traditional Christmas colors. If you'd like a stocking with snowflake pictures, find out more about ordering custom Christmas stockings.